Ever since I picked up The Little Stranger back in 2011 I've been under Sarah Waters's spell. I practically bent over backwards to snag a copy of The Paying Guests from Penguin's First Look program (for review consideration), and I'm certainly glad I went the extra mile. Set in London, 1922, Frances and her mother are dealing with a mountain of debt after her father's death. Both of her brothers were lost in the war, so Frances takes over the lion's share of household chores and bookkeeping. The duo decides to take on lodgers--or "paying guests" to be PC--in order to stay on top of their debt. Leonard and Lilian Barber, the young couple who rent the rooms, are a bit brash and representative of an emerging "clerk class". It's awkward for everyone at the start, but soon, relationships begin to grow among the residents of the house. The first half of the book is devoted to everyone getting to know each other. The latter half of the book takes a starkly different and ominous turn. I won't say more than that to avoid spoilers, but there was a deliciously menacing mood throughout the first half of the book and an almost claustrophobic sense of dread and panic in the latter. What I love most about Waters's writing is the detail. If you've read her work before, you know her books can be a bit slow. That's not a criticism, as I love spending time with her characters, and there's a palpable sense of time and place in her work. While this book takes a lot of her consistent themes into account--class shifts, LGBTQ issues, personal responsibility and decision making--I also felt this novel was a bit of a departure from some of her other work. While I did enjoy it overall, I felt the end was lacking a little something. It seemed to end quickly and a little too neatly. If you're new to Waters's work, I would probably urge you to start with The Little Stranger or, from what I've heard, Fingersmith. However, this is an enjoyable book, and you should definitely give it a go, especially if you're already accustomed to Waters's style. This seems like a perfect fit for me, I mean you got me at London, 1922! Right?? She always picks the BEST time periods! HMMMM!!! I have read the Little Stranger, and although I didn't love it, it really stayed with me. So I am anxiously anticipating this! But ugh, lately whenever I am crazy excited about a new release, the book itself seems to underwhelm me. Anyway, thanks for this--and for avoiding the spoilers! Leila, I just loved the slow-building creepiness of it. Definitely one I'll re-read one of these days. I've had the same thing happening re: crazy excitement and then being slightly let down. I'd definitely give this a go, but maybe start with Fingersmith first. I should have bent over backwards, too. Instead , I did that for The Amthematician's Secret, but I, too, have long been under Sarah Waters' spell. The Little Stranger has been one of the few autumnal books I've reread, along with The Historian (remember that fun read along last year? ;) and Something Wicked This Way Comes which I'm planning in rereading this fall. Oohhh, so many fun readalongs, Bellezza! I hope you liked The Mathematician's Secret! I've read The Little STranger and Fingersmith both. Despite everyone's praise, I actually really didn't like Fingesmith, but really enjoyed The Little Stranger (though the end felt too quick and a lot like you describe this one). I'd be interested in trying The Paying Guests. It sounds more up my alley than others of hers. Well I'm glad to hear you enjoyed my fave of the two! The Little Stranger was so psychologically haunting to me. Great book. I hope you enjoy The Paying Guests if you give it a go! This is the only Waters' book I have - I just might look for The Little Stranger before I start it. I completely agree with you! I felt a little blah about this book, too. It was so much tension and then the ending was just - over? With, I felt, no real resolution on what would happen to the relationship. It was really well-written, but not one that I LOVED. Yep. I think I rolled my eyes at the end, in fact. She's always a fab writer, but definitely not my fave. I'm intrigued by the sound of this. It's too bad it didn't quite wow you but I'll definitely have to look for Sarah Waters' other books. Please do, Katherine! Her writing is awesome! I'm so glad you mentioned starting elsewhere with Waters, because it's something I've been wondering. I have a copy of this and a copy of Fingersmith and have been leaning toward the other before I pick this up...so happy to know my mind was thinking right! Woohoo! Glad to be of help! I hope you love her. I think you will. I don't always crank the reviews out so quickly, but I couldn't wait on this one. I'm definitely going to read this one. I love her writing. I think my favorites are Affinity and The Little Stranger. Great review, Andi! Good choices! She does creepy so well, doesn't she? I liked Fingersmith a lot and have been thinking of where to go next. I've heard good things about Night Watch too, so many lovely books, so little time! I have read nothing by Waters and now I reallllllly want to. Thanks for the suggestions on where to start! Someone in a blog post or a comment recently (aaa I can't remember where I read it!) said that Sarah Waters always writes two-thirds of a really awesome book, and then it collapses a little bit toward the end. At first I was defensive, because I love her so much, but the more I think about it, the more I feel like that's kinda true. Having said that, I loved The Paying Guests. 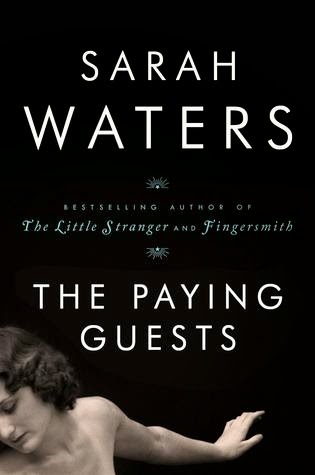 I'd still give Fingersmith to a Sarah Waters newbie, but I enjoyed every minute of reading The Paying Guests. I felt like the endings of The Little Stranger and Affinity were fine for me, but I may feel that way the more I read because it was def the case for this one. I have been wanting to read more books by this author since reading Fingersmith, which I absolutely loved. This one sounds great too. I hope Vance is the reader of some of the others! I've heard nothing but good things about him. I so enjoyed The Little Stranger but have heard a lot of people say that Fingersmith is even better. I keep holding off on that one - I'd hate to read the best thing Water's will ever write and then everything else is less. So maybe I'll pop this one in first. Hmm. This sounds like a really great book but I’ve never read her before so thanks for the advice to start out with a different title. I just read Fingersmith and I really enjoyed it. I did notice that the pace was slow, but wasn't bothered by it either because it was a very rich, atmospheric book.